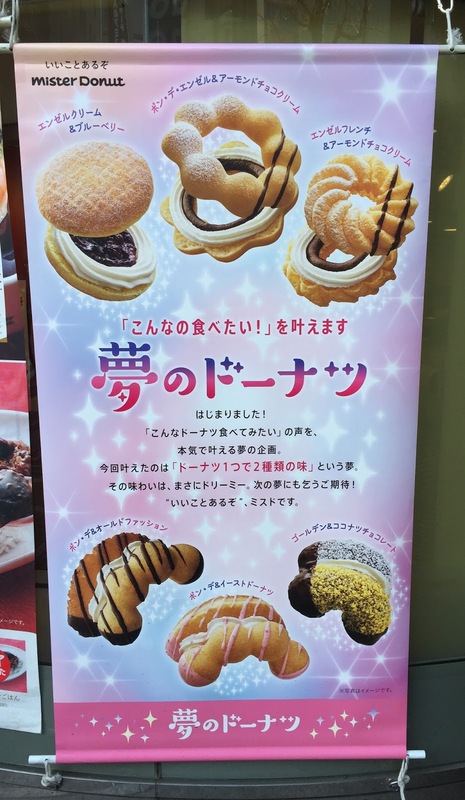 Mister Donut launched 6 special donuts as part of Dream Donuts (夢のドーナツ, Yume No Donuts) which they made customers' wishes come true on March 15, 2017. It's the 2nd series that they did this campaign and this year, the had the dream come true was "to enjoy 2 different flavors in one donut." The donuts are; Angel Cream & Blueberry, Pon De Angel & Almond Chocolate Cream, Angel French & Almond Chocolate Cream, Pon De & Old Fashion, Pon De & Yeast Donut and Golden & Coconuts Chocolate. This time, I bought 4 except Angel Cream & Blueberry and Golden & Coconuts Chocolate, the latter of which is because I don't like coconuts that much and I simply forgot the former donut. 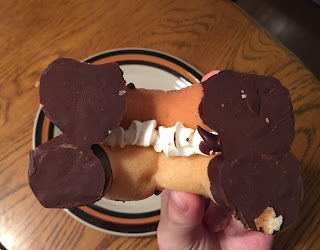 Between halved Pon De Ring and Old Fashion, there's whipped cream and the donuts had drizzles of chocolate and chocolate coating at the cuts. It had Pon De Ring's chewiness and Old Fashion's light dense and crispy textures. I thought the whipped cream wasn't necessary as the donuts were already tasty, but without the cream, the couldn't stick together for sure. 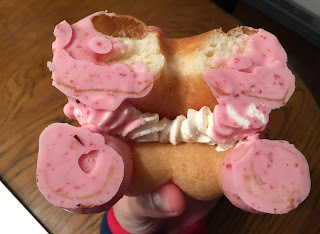 It's combination of Pon De Ring and Yeast Donut with strawberry chocolate and whipped cream. 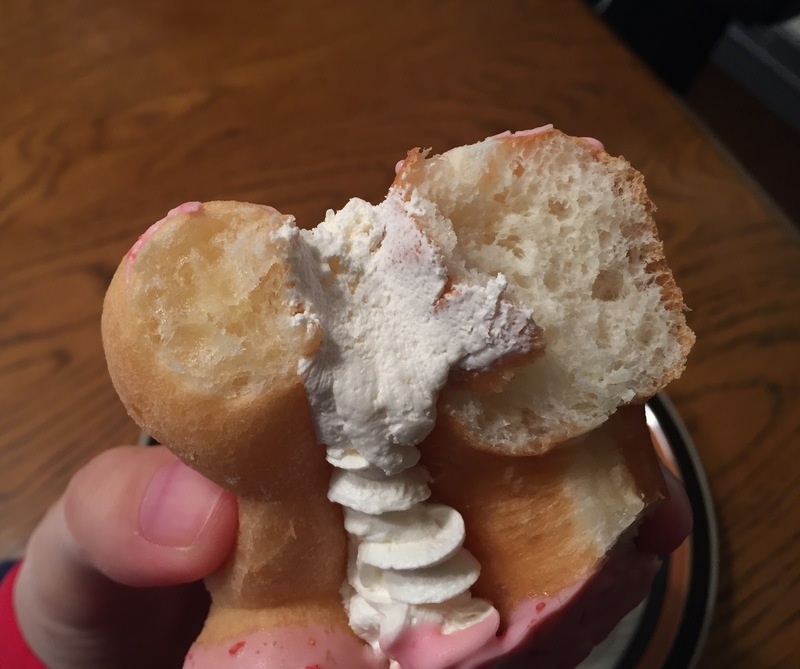 Yeast Donut was soft and fluffy while Pon De Ring was chewy, and every time I bit, the donuts were shifted because of the slippery whipped cream. 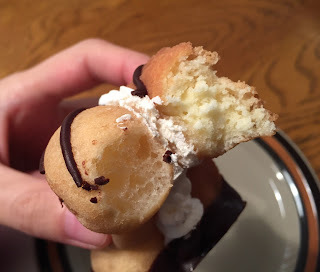 It's topped with powder sugar and chocolate drizzles. There're Angel French's cream and almond chocolate cream. Angel Cream has airy and puffy texture, and usually it's light though it's got whipped cream, but with almond chocolate cream, this donut was much richer. Sliced Pon De Ring with Angel Cream and Almond Chocolate Cream. Chewy Pon De Ring with light whipped cream and nutty almond chocolate cream went well, but the almond chocolate cream was much stronger. 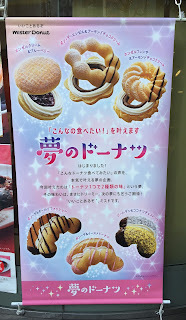 Mister Donut's items I reviewed.